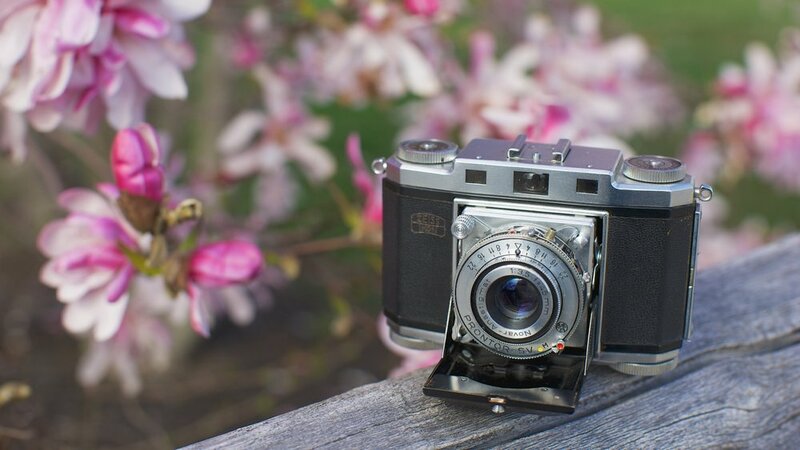 The Zeiss Ikon Contina II is an all-manual 35mm film folding camera first produced in 1952. It offers fitment of either an Opton-Tessar 45mm F/2.8 lens, or the Novar 45mm F/3.5 seen on our review model. Both lenses are capable of making sharp images dripping with vintage charm, with the Tessar having a better reputation for overall quality. The Contina II includes a rangefinder mechanism for easy focusing, making it one of the more usable of the range of antique Zeiss folders. It’s a classic machine from one of the more interesting periods in Zeiss' long and storied history. Accessible to those willing to learn, yet aloof enough to remain unpredictably interesting, it’s both foreign and familiar at the same time. It fits into a pocket, looks like nothing else out there, and makes very respectable images. The arguments for ownership are many, but possibly the best thing about the Zeiss Ikon Contina II is that it’s unique. So unique, in fact, that most photo geeks have never shot anything like it before. And that’s a real shame. As if keeping track of all the options available within the range of Continas isn’t demanding enough, there exists within the model itself a choice to be made. The Contina II offers fitment of either an Opton-Tessar 45mm F/2.8 lens, or the Novar 45mm F/3.5 seen on our version. Both lenses are good, with the Tessar having a better reputation for overall quality. Whether or not this reputation is deserved is debatable, but we’ll get deeper into the lenses a bit later. Aesthetically, the Contina II is a stoic, austere machine. It’s a no-frills, dour camera, though that’s not to say it’s unappealing. When one studies the camera, one begins to imagine that the designers were compulsively obsessed with symmetry. Those of us who share a certain penchant for symmetrical machines will appreciate the measured placement of its various knobs, viewfinder and rangefinder windows, and even its fastening rivets. Shooters accustomed to modern machines or even vintage SLRs will suffer a few stumbles out of the gate. Everyone learns at different speeds, but it took this reviewer nearly thirty frames to begin to feel comfortable. In short order it was pretty clear that the Contina is a camera from an era that required photographers to be meticulous and patient. Exhibit these traits and the Contina II will reward you. But I can’t ignore the fact that some photogs will certainly be frustrated to Hell and back by the sluggish approach to photography that the Contina demands. As we touched on earlier, my review model uses the Novar 45mm Anastigmat F/3.5. For the uninitiated, an anastigmat lens is a lens that’s completely corrected for optical distortion such as spherical aberration, coma, and astigmatism. These days corrected lenses are pretty common (though no less important), but when the Contina II was released it was a really big deal to have a corrected lens.